If you've already figured out your life and feel totally complete, then this book may not be for you. But if you are like the rest of us, every day presents a mountain of to-do items, jobs to go to, errands to run, projects to complete, meals to cook, children to raise... You forge ahead and get it done, but you know that things aren't as they should be. Even when you check every item off your daily list, you still feel as though something meaningful and essential is missing from the very center of your life. 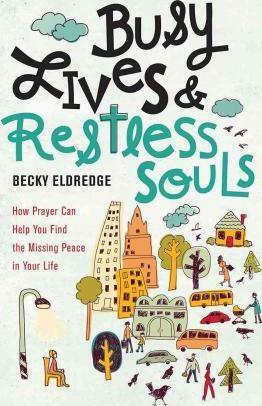 Spiritual director and writer Becky Eldredge has felt that same longing, and she knows what people are missing--a relationship with God through prayer. In Busy Lives & Restless Souls, Eldredge interprets principles of Ignatian spirituality in a fresh way to equip us with prayer tools that are accessible and practical within the relentless realities of our daily routines. Just as important, she shows us how we can bring our relationship with God to life by becoming what St. Ignatius called "contemplatives in action." For all who sense that there is a missing peace in their lives, Busy Lives &Restless Souls will help them find it--right where they are.